Clients suffering from Chronic Obstructive Pulmonary Disease (COPD) will naturally feel anxious about the long term effect on their health and may seek relief through hypnotherapy. While it is recognised that the condition is irreversible, helping them to relax can reduce some of the anxiety they will be feeling which would lead to an improved quality of life. 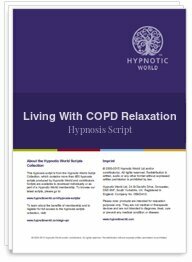 This Living with COPD Relaxation session uses a technique called the complete diaphragm breath to help steady the breathing and is combined with visual imagery to lead them into a gentle hypnotic trance and help your client feel more comfortable.